I started reading this at about 8 PM last night, intending to knock off a few chapters and then stop. I ended up reading it cover to cover over the next few hours. More like this, please. Like Mariner 9, the third American mission to Mars has bad luck with dust storms; the Ares 3 crew got to the surface of Mars safely enough but when it became clear the dust storm was threatening mission safety, the Americans were forced to abort their mission and retreat up to their orbiting interplanetary craft, Hermes. Almost all of the Americans made it alive and well to the surface to orbit rocket that would take them up to Hermes. Almost all but not poor Mark Watney, who was last seen by his companions impaled by an antenna, tumbling away on the storm winds; Mark’s suit telemetry’s last signal tells a sad tale of absent life signs and so, very reluctantly, Mark’s companions abandoned their dead friend to the descicating sands of Mars and fled up to Hermes. What the crew of Hermes will not learn for some time, that last signal was misleading; Mark was injured but survived, his freeze-drying blood creating enough of a seal to preserve sufficient suit integrity to keep him from asphixiating in the near-vaccuum of Mars. Now Mark is marooned alone on Mars with no obvious means to let either the crew of Hermes or the folks back on Earth know he is alive and while the Hab, the astronauts’ surface habitation, was nearly untouched by the storm, it was only intended to provide 31 days of life support. The situation isn’t quite as bad as it seems: that was 31 days for a full roster of astronauts so with just one the supplies will last much longer. There is an Ares 4 mission planned and if Mark can somehow get to their landing site, they might be able to give him a ride home. There are just two catches: Ares 4 will be landing 3200 kilometers away across rough Martian terrain, and it wouldn’t be arriving for four years; even an optimistic assessment of his supplies gives Mark a year’s worth of food. Mark has apparrently traded a fast, nearly painless death for a slow, lingering one, all alone on Mars…. One of my favourite subgenres is interplanetary adventure, more rooted in hard science than planetary romance but not so firmly rooted that the author abandons the idea of crewed exploration and colonization of other bodies in our solar system as an obviously silly idea before they even begin their novel. For years—decades!—I had to made do with a very thin gruel indeed, rereading old favourites and very occasionally finding something new. For the last five or so years, though, there’s been something of a renaissance in this subgenre; just off the top of my head, examples include Pirates of Mars, The Quiet War, the Moon Maze Game,The Highest Frontier, Rocket Girls, Rocket Girls: the Last Planet, The Next Continent, The Ouroboros Wave, Cage of Zeus, Platinum Moon, 2312, Leviathan Wakes, Caliban’s War, Back to the Moon, The Quantum Thief, Gardens of the Sun, Up Against It,Usurper of the Sun, Winning Mars, Threshold, and Blue Remembered Earth. And, obviously, The Martian. I could probaby do a weekly review series just on new interplanetary adventures if only I hadn’t run out of days of the week for themes. There is a particular form “astronaut marooned in space” stories tend to have, from Apollo 13  to Welcome to Mars to Marooned, and while the experienced reader won’t be able to predict exactly what happens in The Martian, they should be able to make educated guesses about how the plot has to develop given such reasonable assumptions as “the author probably didn’t write a book where Mark is rescued in chapter three, and the next 300 pages are the subsequent set of hearings on his misadventure”. Although I would totally read that book. 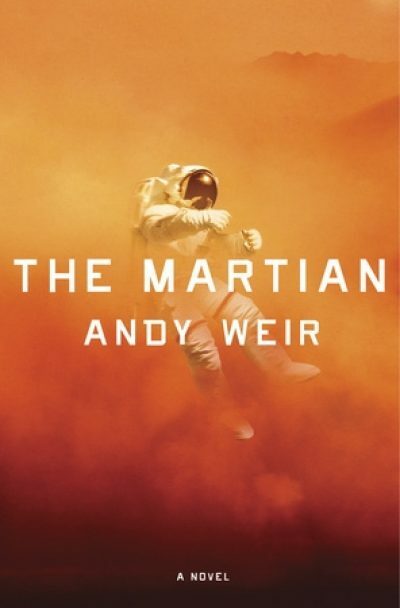 Weir does try to play fair with the reader, sticking to facts as they were known when he published the book; science marching on as it does, I believe certain subplots have been superseded by new information about Mars. Such is the fate of the interplanetary adventure author, which may be why it was so hard to find examples after space probes began taking close, regular looks at other planets. What makes The Martian stand out is its cheerfully vulgar protagonist, trapped on Mars with insuffient food supplies but a seemingly endless quantity of disco music and classic 1970s TV shows. Mark is pretty good at what he does—botany and engineering—and it seems kind of a shame from his point of view that he’s only almost as good as he thinks he is, with a particular skill for coming up with quick short term solutions that he relates in considerable detail, good-enough solutions that often overlook certain important details, which is why at one point the atmosphere of the Hab is 64% hydrogen. It’s not wonderful from his point of view but it’s very entertaining for the reader. The Martian can be purchased here. 1: I feel like I need ot acknowledge that the film Apollo 13 was based on real events. I’d have mentioned Lovell’s Lost Moon but I have never read it. “NASA decisions that seemed sensible at the time that led to horrible catastrophic mishaps” is also a possible theme for reviews.